There has been a chill in the air all weekend which makes me crave comfort food. Stuffed potatoes takes me back to my childhood, but I have put a modern, and more healthy, twist on traditional baked potatoes. I have always loved chicken with Asian chicken sauce. Until a trip to Indonesia, I made it Thai style with coconut milk, but an Indonesian woman taught me this recipe which I now use because it’s so easy and has minimal ingredients. These serve as a main course and are inspired by chicken satay. This recipe is so easy! While the potatoes cook in the microwave, you can assemble everything else, including the sauce. Then add a few condiments to adorn your dish and you are done. Note: This can serve as many as four if you use half a potato per person. We eat smaller dinners, so this is ample for my family, but some families may want a whole potato per person, in which case this will only serve two. To microwave a regular potato, simply wash it, pierce it many times with a fork and then microwave for 4 minutes. Turn it over with tongs and cook another 3 minutes, until it’s super tender. Pull breasts off chicken, shred with your hands and set aside. To make the sauce, combine boiling water, peanut butter, brown sugar, soy sauce, ginger paste and lime juice. Stir until well combined and smooth. Pour half of the sauce over the chicken and stir to coat. Set it aside and slice the green onions, chop the cilantro and cucumber. Slice the potatoes in half and place one half on each plate. Add salt and pepper. Take a fork and smash the inside and add 1 teaspoon peanut sauce to each potato. Next, top with shredded chicken, carrots, cilantro, onion and cucumber. Drizzle with remaining peanut sauce and serve. This entry was posted in 10 minute recipes, Healthy Recipes, Main Courses, Uncategorized and tagged asian, baked potato, cilantro, dinner, easy, family, healthy, peanut butter, peanut sauce, quick, rotisserie chicken, simple on October 14, 2018 by Juliana Goodwin. Looking for something easy, light and refreshing in this summer heat? Well, try my lettuce wraps. They are SO EASY and healthy. They are versatile, too. You can add any vegetable you’d like. I have swapped soba noodles for rice noodles; added snow peas in my wraps; and love to add shiitake mushrooms!!! A little mint is nice, too. Thinly sliced daikon is great in these. The more veggies, the merrier. 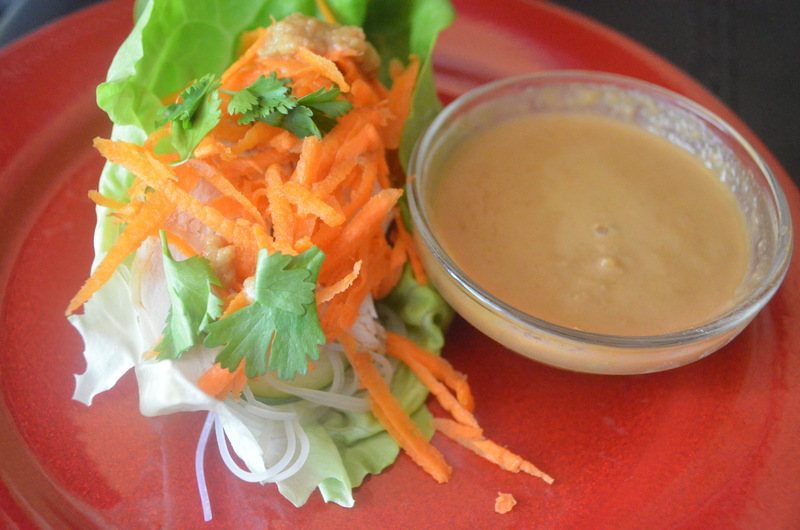 The peanut sauce comes together in minutes. It doesn’t have any ginger, but you can add some if you ‘d like.I’d suggest starting with 1/8 teaspoon and going from there because ginger is potent. There’s hardly any cooking in this recipe, so it’s perfect for people who don’t want to spend much time in the kitchen. First: cook your rice noodles according to package directions. They cook fast, usually in about 3 minutes. When they are done, drizzle with sesame oil or your favorite Asian salad dressing like Sesame Ginger. Rice noodles are fairly flavorless and this will add some depth of flavor and prevent them from sticking together. If you want then to cool quickly, place in a metal bowl and pop it in the fridge. Slice all the vegetables and place on a large platter or divide them between two plates. Remove the skin from the chicken and place on a plate. For the sauce: Stir all ingredients together until they are combined. The water must be very hot to dissolve the peanut butter. You can also make this on a stovetop in a small pot, but then it needs to cool before serving because the peanut butter will separate and become too thin while piping hot. Then make your own wraps by placing desired toppings in the lettuce leaves and then either topping it with peanut sauce or dipping in peanut sauce. Sprinkle with sliced green onion and eat. 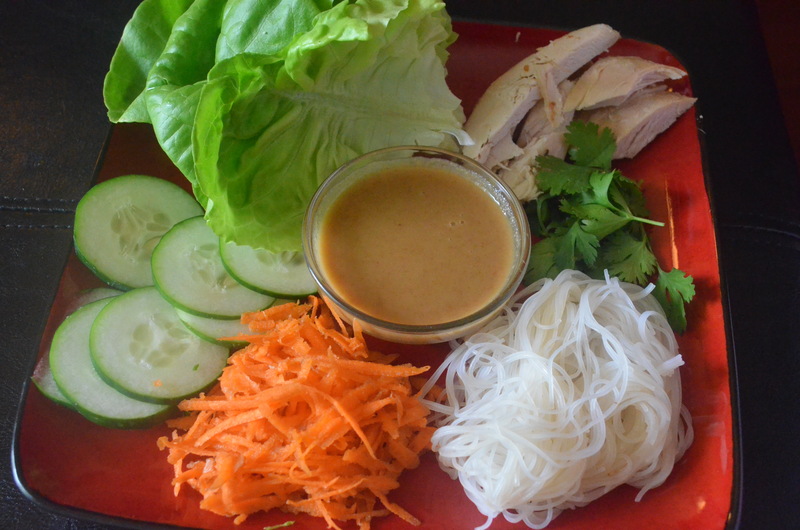 This entry was posted in Healthy Recipes, Main Courses and tagged asian, Bibb lettuce, carrot, cilantro, cucumber, dinner, easy, healthy, lettuce wraps, low fat, lunch, peanut butter, peanut sauce, rotisserie chicken, Thai, vegetables on July 7, 2015 by Juliana Goodwin.